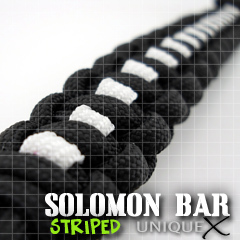 The Striped Solomon Bar is a regular Solomon Bar with gutted strip of paracord weaved through the center of the bracelet in a straight line. It's pretty easy to tie, just weave the gutted strip in as you are tying the Solomon Bar. For the bracelet I used eight feet of black paracord and about eight inches of white paracord. For the buckle I used a 5/8" contoured side release buckle that was purchased from Creative Designworks. 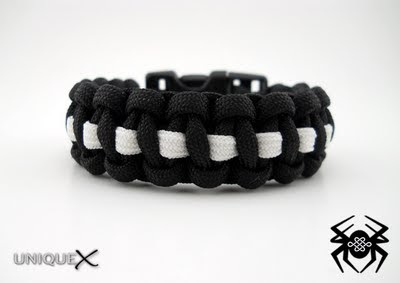 To tie this bracelet, you need to decide on the closure and which technique you would like to use, I chose to use a 5/8" contoured side release buckle. If you don't have a side release buckle or don't want to use one, you can use the loop and knot method or JD's Elastic Solomon Bar Bracelet method which uses an elastic cord. 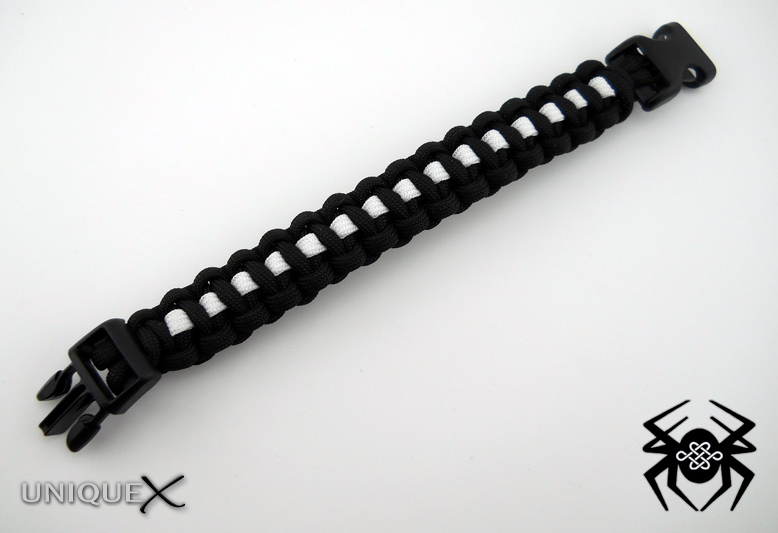 Stormdrane has a great tutorial for tying a Solomon Bar bracelet using side release buckles. 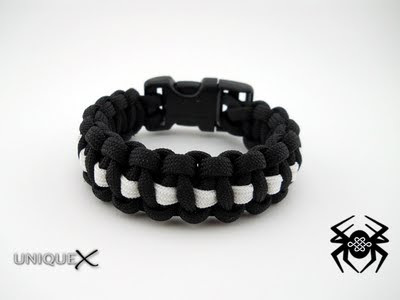 Follow his tutorial but weave in the strip of paracord along the center that will go over-and-under the top. I chose to gut the strip because I believe it looks better but you can experiment with gutted and un-gutted paracord to decide for yourself. You can tie the bracelet leaving it loose or as in my case, I made it really tight so that the gutted white strip will almost poke out and it gives the bracelet a thicker appearance, but it will also require more paracord to tie.